We want you to be away by your experience at the Maison de Sasagawa and to be sad to leave. We hope you will return and become a regular part of the Maison de Sasagawa tradition and family. We want the lodge to be a place you will always remember. Staying at Maison de Sasagawa was not only very enjoyable and comfortable, but a great way to get to know a real friendly Japanese family and experience the Japanese cultures and their ways. 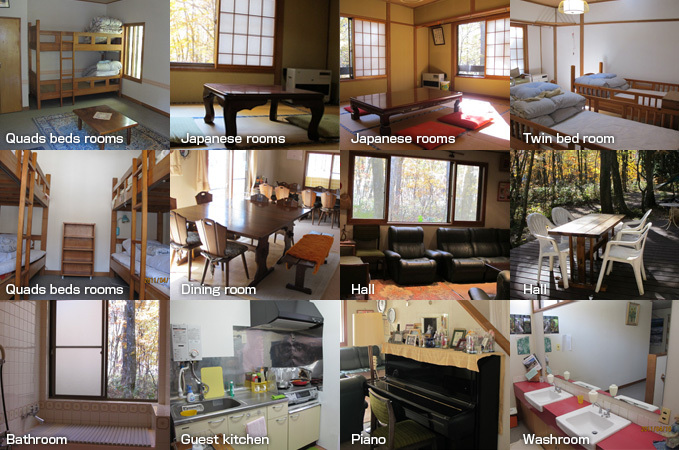 The lodge is run by Yoko and her family. Staying here is not like staying at a big 5 star hotel, but has a more family and a not so professional laid-back feeling. The main areas of the lodge are shared with Yoko`s children and you may find you join with them in watching TV or playing with them and their toys. The dinning room is also shared by all giving it a real `big family` feel. The kitchen at Maison de Sasagawa is communal and if you are cooking you might be cooking at the same time as Yoko and get to see the Japanese way of cooking. and pleasure as it does us. Please tell us, when you bring friends who are not staying at our lodge. Our dinning area offers a hot breakfast your request. We have a ski room for you dry and store your gear, as well as all the tools and equipment you may need for repairs. Please taking care of your wallet, passport and other valuables by your own responsibility. Maison de Sasagawa is not responsible for any loss and theft or damage to valuable or cash. We provide free transfers to and from Hakuba train station or Happo bus terminal. Also we can take you to super market when you need. Copyright(c) 2010 Maisan de sasagawa. All Rights Reserved.